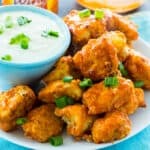 Air Fryer Buffalo Chicken Bites cook up super fast in the Air Fryer and have lots of spicy flavor. So easy to make and they taste great dipped in some blue cheese dressing. 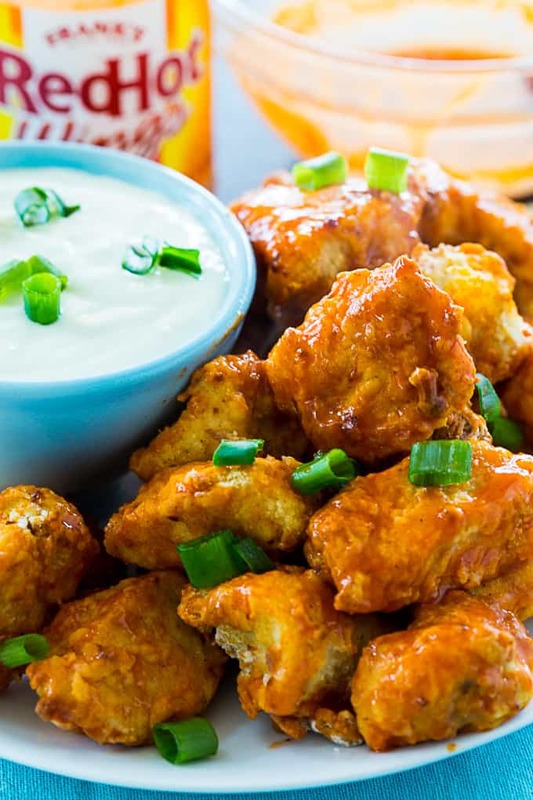 The Air Fryer helps keep these Air Fryer Buffalo Chicken Bites low in fat and calories. 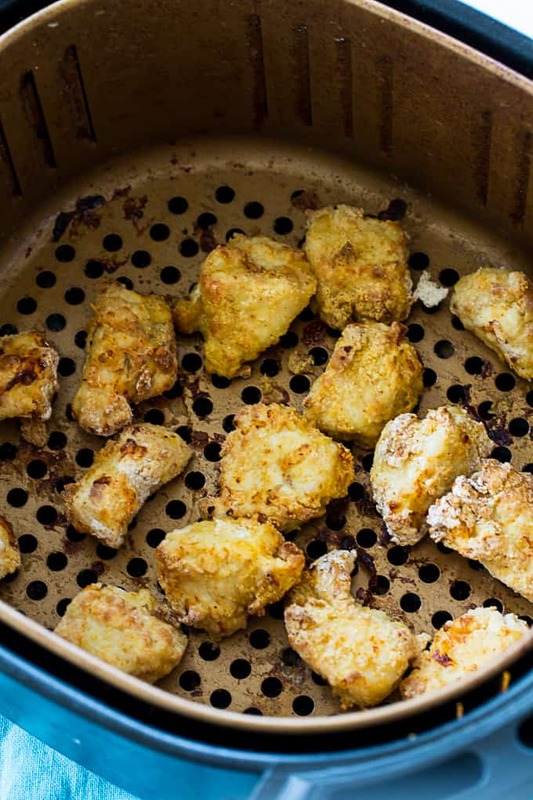 Only a little oil is needed and the Air Fryer does a super job of getting the chicken bites browned and crispy on the outside and juicy on the inside. To make Air Fryer Buffalo Chicken Bites, boneless, skinless chicken breasts are cut into bite-sized pieces and then dipped in a mixture of egg and milk. They are then coated in a mixture of flour, salt, garlic powder, parika, and cayenne pepper. Tip: I find it’s best to refrigerate the flour coated chicken pieces for 20 to 30 minutes. Some of the flour gets absorbed and it tends brown up better in the Air Fryer. If you are pressed for time, you can skip this step. Spray the chicken pieces with olive oil. Preheat the Air Fryer for 2 minutes and then Air Fry the chicken pieces for about 12 minutes. 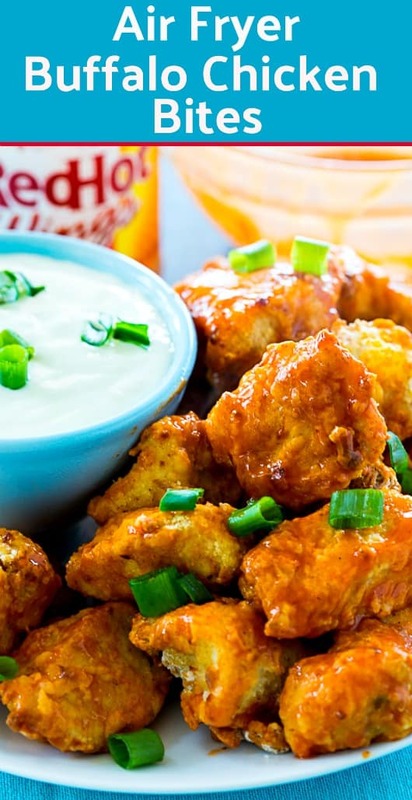 Toss them with Buffalo sauce and serve them with blue cheese dressing. Combine first 5 ingredients in a medium bowl and stir to mix. Set aside. Whisk together egg and milk in a second bowl. Set aside. Cut chicken into bite-sized (1-inch) pieces. Coat in egg mixture and then toss to coat in flour mixture. Works best if you only coat 3 to 4 pieces at a time. Place coated chicken pieces on a plate. Refrigerate coated chicken for 20 minutes. Note: you can skip this step but I find it helps the flour brown up better. Spray both sides of chicken with olive oil. Set Air Fryer to 370 degrees for 14 minutes. Let preheat for 2 minutes. When timer says 12 minutes, place chicken in Air Fryer basket. Do not crowd. You will probably want to cook them in 2 batches. Air Fry for the remianing 12 minutes, shaking basket halfway through. Note: Cooking time can vary based on Air Fryer and size of chicken pieces. Use it as an estimate only. 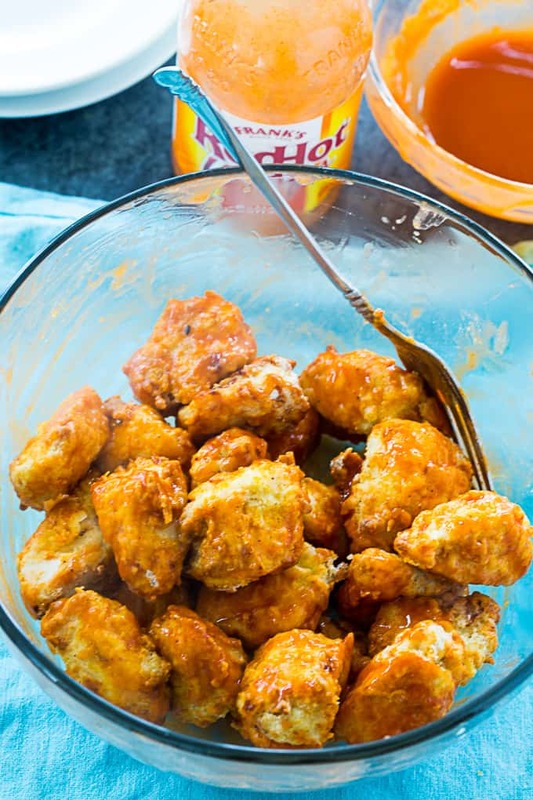 Toss with buffalo sauce and serve with blue cheese dressing for dipping. Disclosure: Nutritional info is provided as a guide only and can vary based on products and brands used and cooking methods.